Photo from a previous Quest for Stars balloon mission, looking down at the Los Angeles basin from the edge of space. When NASA's space shuttle Discovery streaks into the sky on its final mission this week, a camera-toting balloon designed in part by high school students will be ready to photograph the launch from the edge of space. Discovery is slated to blast off Thursday (Feb. 24) at 4:50 p.m. EST (2150 GMT) from NASA's Kennedy Space Center in Cape Canaveral, Fla. It's the final flight of Discovery before NASA retires its space shuttle fleet for good later this year. To record the historic last flight, a team of students helped equip a high-altitude helium balloon with multiple cameras, an onboard computer system, mobile phones and a Global Positioning System (GPS) device. The goal is to photograph Discovery from an altitude of about 100,000 feet (30,303 meters). High school students from San Diego helped waterproof the balloon's payload bay, organizers said. The balloon mission is a joint effort of two non-profit educational organizations, the Challenger Center for Space Science Education and Quest for Stars. 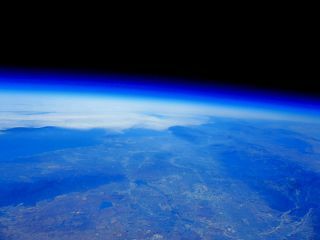 The California-based Quest for Stars lets middle-school and high-school students help place balloon-borne experiments at the edge of space using relatively cheap, off-the-shelf hardware. "Our goal: Capture space shuttle Discovery in supersonic transit through the stratosphere while exciting 1000s of students to pursue science!" Quest for Stars founder and CEO Bobby Russell wrote in a Feb. 18 Twitter post. The homemade balloon is scheduled to lift off an hour or two before Discovery's launch from a nearby location in Florida, Russell said, stressing that everything has been coordinated with the proper authorities, including the Federal Aviation Administration. If Discovery is delayed, the balloon mission will be ready to go on subsequent days, mission planners said. The balloon is designed to rise at a rate of 800 to 1,000 feet (242 to 303 meters) per minute. It will photograph Discovery from an altitude somewhere between 80,000 and 100,000 feet (24,242 to 30,303 meters), Russell said. Shortly thereafter, the balloon should pop. "The balloon keeps expanding and expanding until it can't hold the gas anymore," Russell told SPACE.com. "It will literally explode." At that point, the balloon's payload will drift down to Earth via parachute, and a recovery team will retrieve it. Quest for Stars travels to middle schools and high schools to brief students on missions like these, and then brings the resulting images and souvenirs back to the kids. The main goal is to get students excited about space science by letting them participate in the process. The group doesn't charge the schools or students anything, Russell said — it's funded by donations. "We bring this to schools at zero cost," Russell added. The upcoming Discovery photo mission is the second balloon launch Quest for Stars will be launching for educational campaigns. A shot of a previous Quest for Stars balloon mission rising toward the edge of space. Quest for Stars plans to launch a third balloon mission from Florida in March, and then expand from there with additional flights in other parts of the country, Russell said. The group hopes to help inspire the next generation of American scientists and engineers. "In this country, there seems to be a big push toward business degrees, and a trend away from science and technology," Russell said. "We're trying to bring excitement to science." This is the first joint mission operated by Quest for Stars and the Challenger Center for Space Science Education, an organization set up in 1986 by families of the astronauts lost in the space shuttle Challenger accident that year. Two smartphones on the balloon will be recording video during the mission, and the video will be streamed live as the craft sails through the air, officials said. The video can be watched at: http://www.ustream.tv/channel/chasing-discovery. You can follow SPACE.com senior writer Mike Wall on Twitter: @michaeldwall. Follow staff writer Denise Chow (@denisechow) for shuttle Discovery launch updates from NASA's Kennedy Space Center in Cape Canaveral, Fla.